Washing machines and dryers make light work of cleaning dirty laundry, but if there is grease in either machine, they can leave your laundry more stained than before. Grease is a very difficult stain to remove from clothing, particularly if it has been set in with heat, so it's essential that you remove the grease from the source. Some grease deposits in your washing machine or dryer may be indicative of a mechanical problem with your machine and will require service. You can easily remove the grease yourself if it was left by an object you placed in the machine. 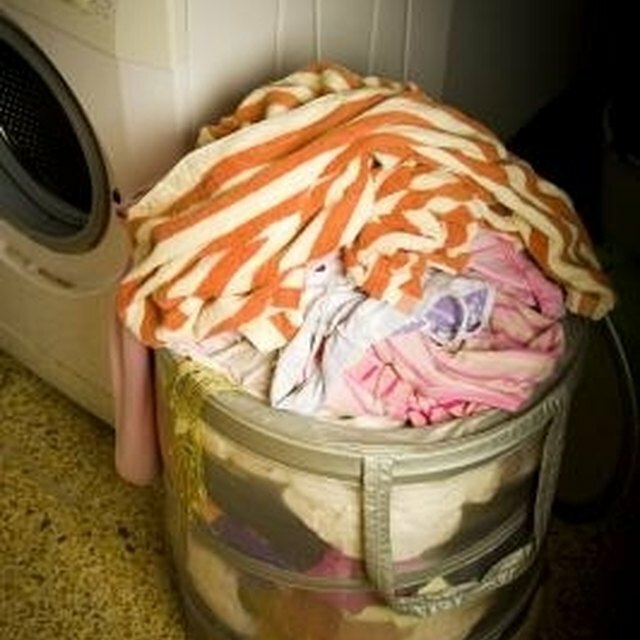 Grease stains on your clean laundry could be a sign that there is grease on the inside of your washing machine or dryer. Spray the entire inside surface of your washer or dryer with Simple Green concentrated spray cleaner. "Extreme Simple Green(r) Motorsports is a cleaning and degreasing product that is extremely aggressive on grease and heavy soils, but won't harm the high end surfaces," according to the product's website. Although marketed for use with motorsports equipment, it will work well inside your greasy washer or dryer. Wipe the entire inside surface of the machine with a household cleaning sponge. Use the abrasive side of your sponge for stubborn spots. Rinse the washer or dryer with clean water and a household cleaning sponge to remove any cleaning product before beginning your next load of laundry. Apply Goo Gone(r) stain remover directly to grease spots and allow to set for about five minutes. If the Simple Green(r) concentrated cleaner removed all the grease spots sufficiently, skip the Goo Gone(r) process. Scrub grease spot away with a household cleaning sponge. Reapply cleaner as necessary until the spot is completely removed. Rinse with clean water and a sponge to remove the cleaning products from the inside of your machine. Wash and dry a test load of cleaning rags or old work clothes to make sure the grease problem is gone. If you have removed all the visible grease from the inside surface of your machine, but grease is still deposited onto your laundry, you may have a mechanical problem that needs to be checked out by a service professional. Running an empty washing cycle with vinegar is a safe and effective way to remove many stains as well. Vinegar is non-toxic and won't damage clothing or machinery.